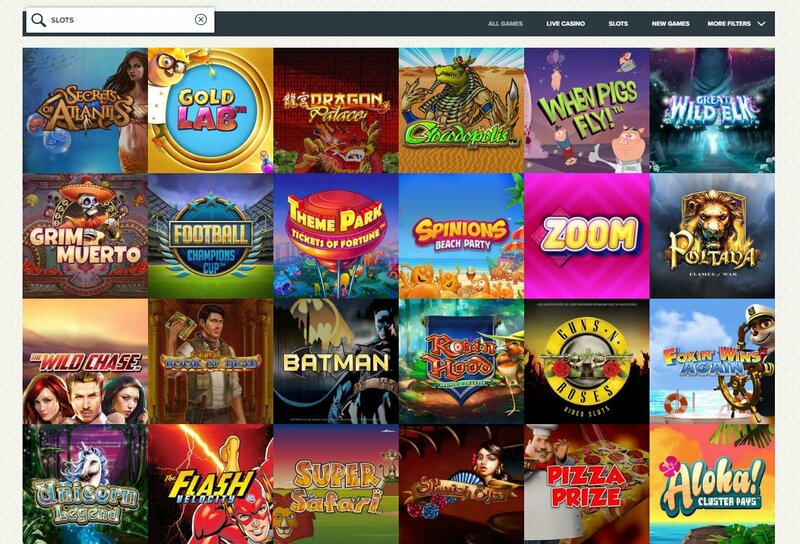 SuperLenny Casino offers nearly 700 games produced by Microgaming, NetEnt, Betsoft, Nyx Interactive and Play’n GO. They can be played on mobile devices powered by various operating systems. Super Lenny is not your regular casino, but a gambling operator with a unique identity. It even has a mascot and those who land on its website are unlikely to mistake the casino for one of its rivals. As part of the prestigious BetIt Operations group, "It is one of the fastest rising and most important casinos on the network. Like its counterparts, it was built around an unusual concept that proved to be popular among players. Since 2014, they set important milestones and the sky’s the limit." SuperLenny online casino doesn’t turn a blind eye to the risks posed by cyber criminals and these. There are plenty who would do anything to get their hands on sensitive information if not the players’ money. A single line of defense is never enough and that’s why several mechanisms are in place simultaneously. The firewalls protect all the information exchanged between the website and customers. If this line is breached, wrongdoers will still have to find a way the complex 128 bit SSL encryption. The combined power of the security systems acts as a deterrent for those who might target Super Lenny Casino players. Information is not shared by the casino either and even when someone wins a larger amount, his or her identity is protected. The casino will let the gambling community know that someone has scooped a significant sum, without disclosing any personal data. Last but definitely not least, all the games are audited for fairness by eCogra. This is a well known and respectable independent auditing firm. Microgaming, NetEnt, Betsoft, Nyx Interactive and Play'n GO are the software providers supplying slot machines. SuperLenny Casino games also include video pokers and table games, although they are less numerous than video slots. A trend has emerged and five reel slots are preferred, but the three reel variety is still well represented. Wild Water, Gonzo's Quest, Immortal Romance, Medusa, Merlin's Millions, Jack Hammer and Big Bad Wolf are some of the most popular. SuperLenny.com is stacked with games including live dealers. The best chance to strike it rich overnight is by winning one of the SuperLenny Casino jackpots. These are pooled across the entire network of casinos powered by various software developers. Microgaming and NetEnt are the leading producers of games and they are the ones with the widest network. Those who accept intense competition will win larger amounts when they finally hit the winning combination. There is also the possibility of focusing your attention exclusively on jackpots that are won locally. SuperLenny Casino table games come in different flavors: virtual games and those compatible with real dealers. Blackjack is the best represented at this online casino, as players get to choose between the classic game, Spanish blackjack, double exposure blackjack and single deck blackjack. Roulette comes in second, with French, European and American versions, playable against the RNG and real dealers. Action never ends at live blackjack, live baccarat, live roulette, live casino hold'em and auto roulette tables. TXS Hold'em, Baccarat, Oasis Poker, Caribbean Stud, Red Dog Progressive, and Casino Hold'em are also featured. Video pokers can only be played against the random number generator, but they run smoothly on mobile devices. There are 40 different games belonging to this genre including Jacks or Better, Deuces Wild, All-American Poker, Joker Poker, Tens or Better, Double Joker, Bonus Deuces and All Aces. Those who seek specialty games will be thrilled to discover bingo, keno, instant wins and scratch cards. All the games mentioned above can be played on mobile devices powered by iOS and Android systems. Special promotions and exclusive bonuses are occasionally offered to those who bet on smartphones and tablets. All other offers can be claimed using these gadgets, so nothing is lost by mobile fans. The same level of customization is possible on desktop computers and mobile devices. Players have the option of enjoying slots and video poker in single hand format or use the autoplay feature to speed up their gaming. The first SuperLenny Casino bonus that can be claimed is the one offered to those who sign up for a real money account. Only the first deposit is doubled up to a maximum of €100, but the second investment is also matched by 50%. Players who commit €100 in a quick succession will start their online gambling adventure with an additional €150 or currency equivalent. Each time they make a qualifying deposit they also receive 50 free spins, which are not restricted to any game. After these two deposits and once the free spins are credited, players will be eligible for another bundle of just as many bonus rounds. As soon as they bet a combined amount of €350, the remaining 50 free spins will be awarded. The best part about this promotion is that players hit two birds with one stone. As they claw their way to another batch of 50 free spins, they start meeting the wagering requirements for the bonus. This and the resulting profits from the use of free spins need to be played through 60 times. No less then can 150 free spins are available for new players along with cash welcome bonuses. SuperLenny online casino is currently working on a loyalty scheme. They have realized the importance of customer retention and came up with new and more effective ways of keeping players happy. The introduction of BUX is a shining example and the popularity of the virtual currency is rapidly rising. These are awarded to new players as well as those who reload their accounts, as bonus funds. They can easily be converted into free spins and used to play any of the slots available. Deposits can be made via Maestro, MasterCard, Neteller, Paysafe Card, instaDebit, Visa, iDEAL, Sofortuberwaisung, POLi, Euteller, Trustly, Skrill, PugglePay and Skrill 1-Tap. Some of these financial instruments can’t be used for withdrawals, or don’t work in certain countries. Ideally, players should use the same payment method for both transactions. This will mitigate the risks of money laundering and identity fraud, hence make online gambling safer and more transparent. The FAQ section provides useful advice to those who are not certain about how a payment method would fair. Customer support can provide assistance to those who run into technical problems or are unable to cash out their profits. 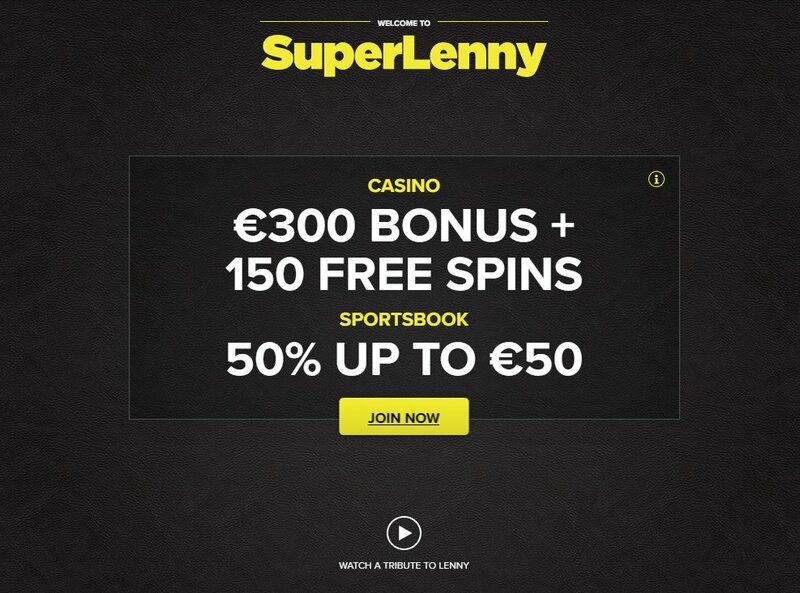 The SuperLenny Casino payment method can be used without paying any commission and there are no hidden fees. The list of accepted currencies includes Norwegian and Swedish kronor in addition to Euros, British pounds sterling and US dollars. SuperLenny Online Casino customer support doesn’t work round-the-clock, but can be reached between 10 AM and midnight. This is when someone is expected to reply to promptly to those who use the live chat feature. Outside these hours, players can make a phone call or send an email, using the online form. Customer support is offered in Swedish, Finnish and Norwegian in addition to English. The casino has an FAQ section that contains useful answers to most of the common questions. There is also a good chance to find valuable information on the forums. Those who choose to write an email during the night can expect to receive a reply before 11 AM. www.superlenny.com isn’t a one trick pony, but a fully fledged online gambling operator. It offers multiple opportunities for those who want to bet on sports in addition to play casino games. The collection of slot machines, video pokers and table games has almost doubled each year since its inception. Despite being a relatively new operator, established in 2014, it has built a solid reputation and can be trusted by both amateurs and highrollers. 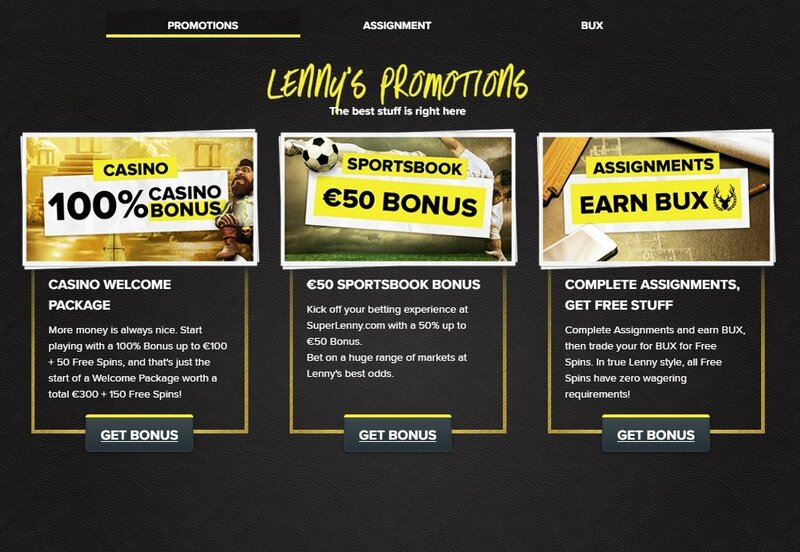 For the time being, the best promotions are aimed at new customers, but SuperLenny Casino is making amends. They pay more attention to the needs of regular players and the loyalty scheme revolving around BUX is encouraging. This is a great place to open an account if you want to enjoy a mix of live and virtual table games, although slots get the lion’s share. The casino is user-friendly, but could definitely use the introduction of a dedicated mobile app, for a more streamlines experience. Enjoyed LennyCasino's cool vibe? have any reservations? please share with us and our other readers. What Makes Unique Casino Stand out from the Crowd?